Want to learn how to make a costume using a mask pattern? Well, don't be scared it's easy! Halloween is sneaking up on you and if you’re caught without a costume, it could be scary! Don’t scream. With a creative mask pattern or stencil you have the start of a unique costume. Plus you’ll have a great time making it yourself. And as you may have guessed, there are many ways to use stencils to create a costume. We are going to explore several of them here. So, let’s get to it and don’t be scared. The Pirate Skull Mask pattern is available to you free at Printable Halloween Masks and you can find a few ideas to complete the costume below! OK! So there aren’t too many stencils out there that are specifically designed as a Halloween mask pattern. But there are plenty of Halloween Stencils that you could use as a mask. And if you put your imagination to work, you can even use some pumpkin carving stencils to work as a mask too. 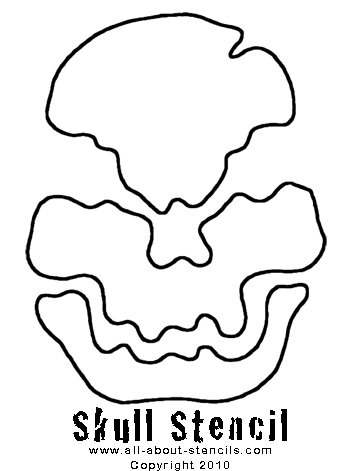 This is the Skull Stencil from the Free Pumpkin Carving Stencils. We're going to use it to make a mask pattern. First, I printed the stencil, cut out the openings (islands) with a craft knife and then traced them onto a sheet of white felt. With a pair of scissors, I cut out the three parts of the skull and glued them to a sheet of black felt with the traced side down in order to cover up your trace marks. I used a hot glue gun for this but if you don’t have one, regular school glue will work you’ll just have to wait for it to dry. Make sure to read all instructions to make sure the glue is safe for use for this purpose (near the face). Next, I made holes on each side just below the eyes to tie my ribbon through. I used a hole punch tool to make this easy. You can tie your ribbon or use a hot glue gun to secure it. 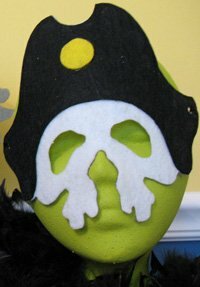 Last, I cut the black felt down close to the skull pieces and left space to go around the ribbon holes. I was a little dramatic with this and left a little extra on the chin for effect. You don’t have to do that. And don't forget to cut the holes for the eyes, nose and mouth. Well, this was a quick job and took only about fifteen minutes from start to finish. It’s just to show how you can use a simple pumpkin carving stencil as a mask pattern. I hope you give it a try! Because these Halloween craft masks are printable, you can adjust the size to fit by reducing or enlarging on a copy machine. That means that they can be made for adults or children. Why not have some real fun and dress the whole family in the same costume (like a pack of wolves or a band of dead pirates)? Let me just mention another creative way to use these stencils designed for pumpkin carving as a mask pattern. Try using the old stand-by sheet for a ghost costume but paint any of these stencils in the face area and cut out the eyes on the pattern. Use a little creativity and decorate the rest of the sheet too. Also, just because these Halloween stencils and patterns were designed for pumpkins doesn’t mean that they can’t be used for a large variety of other Halloween crafts such as: paint them on a bag for collecting your treats; paint them on the corner of a napkin to decorate your festive table; or paint it on colored paper for decorating the windows or doors. There are many other ways to use these wonderful designs to embellish your holiday decorations. And speaking of the many possibilities that stencils give us to decorate, here are some more creative and easy ideas. When we were kids we loved making our own costumes except we didn’t have all the fancy stuff like felt and craft foam or patterns from the internet (I’m dating myself aren’t I?). It didn’t matter because we had a ball coming up with ideas using the things we could easily find around the house. It’s just that now we do have the Internet so the possibilities are endless. Here is one of our tried and true methods of mask making. I just added a new twist since we have the ease of the internet. Take large paper bags (big enough so that you can slide it over the head). Paint the bag orange and then use one of the free pumpkin carving stencils to cut out the face on the front of the bag. You may need to trim out for the shoulders so that the bag can come down low in the front and don’t forget to cut out holes around the ears for good hearing. It’s quick, easy and best of all free! Halloween stencils offer an easy way to trick (or treat!) out a t-shirt. Use an old one from the closet or purchase a new one (old is preferable). If you have an orange shirt, use black fabric paint to put the image from a pumpkin carving stencil across the front of the shirt. If you have a black shirt handy then use orange or white fabric paint. For more information on using stencils to put images on t-shirts, head over to our page on Fabric Stenciling. Now let’s come up with a few ideas to match with some popular Halloween stencils that you can now use as a mask pattern. Feel like howling at the moon? A wolf mask is easy to complete as a costume with a gray t-shirt and gray sweat pants. And wolf, werewolf, wild dog or toothy beast patterns are easy to find. Big fan of pirates? They're all the craze now. Complete the costume of the mask pattern at the top of the page with a blousy white shirt, an old pair of jeans that are cut ragged at the bottom, a wide leather belt and an old pair of boots. Tie a red bandana around the upper arm or thigh. For some extra fun, wrap one leg with the paper from a brown bag so that it will look like a wooden leg. Feel like a feline? Black cats are always popular at Halloween. Complete a cat mask with a black turtle neck shirt, black leggings and a black feather boa for a tail. Want to be Frankie Baby? That’s an easy one! Dress up a mask with an old plaid flannel shirt, a ragged pair of jeans and a pair of work boots. Are you a Witch? I mean for Halloween! You need to have an old loose fitting black dress (try a thrift store if you don’t have one that you can use) and a broom. Here’s a pattern for a Witch Hat. It’s a pdf file for you to print. It’s free. Enjoy! We are thrilled to introduce these downloadable and Printable Stencils. Printable Stencils. Instant gratification at its finest! You don't need a special printer - these designs are specially formatted to print straight from your home computer on standard letter sized paper. Once downloaded, you will have your complete stencil booklet with patterns and instructions. Just click, buy and print! 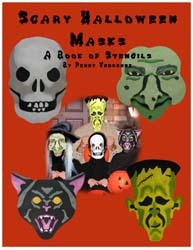 The book below has a collection of mask pattern stencils and is just one of many that we offer. Each book will come to you as a down-loadable pdf file in your e-mail. Just check your e-mail after purchase for the link to connect to your file and print or save. It's that easy! Create your own costume with these 4 fun mask patterns - a Witch, a Skull, Frankenstein's Monster and a Black Cat. You’ll find four Scary Halloween Mask patterns for you to paint on paper for cut out masks. These stencils have several overlays so that the detail really comes out. Complete instructions are included. Or if you'd rather get your Stencil Pattern Books in Print (like these or the Scary Halloween Mask Pattern Book) then visit our Printer's Book Shop for a large variety of stencil collections. These books are easy to follow and come with complete instructions. You'll find all of the stencil designs used as samples throughout this site. Now come on! I know there are hundreds of other great ideas out there that need to be shared and shown off. I know how creative you can be when you get started so don’t be frightened to try something new. Create a costume using a stencil or mask pattern and finish up with some other fun ideas. And don’t forget that I (and everyone else) want to see what you have done with your Mask Pattern Stencils. Just click on Stenciling Projects to get your masterpiece showcased here on this web site. Won’t that be exciting! Or if you have any questions or want to share information join in on the Stencil Blog Well, I hope to hear from you soon. I hope your Halloween is a real Scream! Return to Home Page from Mask Patterns. Return to Halloween Crafts from Mask Patterns.